46B Monte Dourado is a first floor apartment with stunning views of the cove of Carvoeiro and the sea. 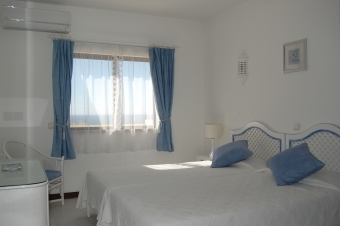 This is stylish 2 bedrooms and 2 bathrooms property, close to the centre of Carvoeiro. There are two communal pools in front of the apartment (plus use of 4 others on Monte Dourado), 2 tennis courts on site, and beautiful Carvoeiro beach is only a few minutes walk, as are a large a selection of bars, shops and restaurants. On entry into 46B consists of two spacious twin bedrooms both with air conditioning, and large wardrobes with a safe in one. A shower room and a bathroom with shower over the bath, a fully equipped kitchen and lounge dining area with FTA TV, DVD player and log fire. From the lounge is a large balcony terrace with stunning views of Carvoeiro and the sea. There is a table and chairs which allow you to enjoy your breakfast and the views at the same time. All linen and towels are supplied. There is no smoking inside, however it is allowed on the terrace. Please note the location may not be suitable to people with mobility problems however the taxis are not expensive . Access to Monte Dourado facilities including 5 swimming pools and a tennis court. ARRIVAL AND DEPARTURE... Arrival after 15H00 and departure before 11H00.